The 6-Inch Clip-on Fan is a great little product that’s ideal for keeping the air moving around in a small area such as a grow tent, without it taking up valuable floor-space like a pedestal fan. The fan can be clipped to a tent frame, shelf or any similar width fixing. The main body can be tilted and swivelled on the clip so that it points in the direction that you want it to blow. The fan has 2 speeds and is designed to create very little noise. The fan only uses 15 Watts of power which makes it very cheap to run. Simply locate the fan by squeezing the ends of the clip together and locating the jaws over the pole a tent-frame, shelf or similar width item and release. The jaws will hold on, keeping the fan in place. Rotate and tilt the head on it’s pivot so that it is pointing in the correct direction. Plug the fan into a mains outlet and then switch the fan to “1” for a light breeze or to “2” for a stronger flow of air. The switch can be set back to “0” to switch the fan off again. Never connect an air circulation fan to a fan speed controller. Only use the fans own speed switches to control the fan speed. If an air circulation fan is connected to a fan speed controller designed for in-line duct fans then it will burn out and possibly start a fire. 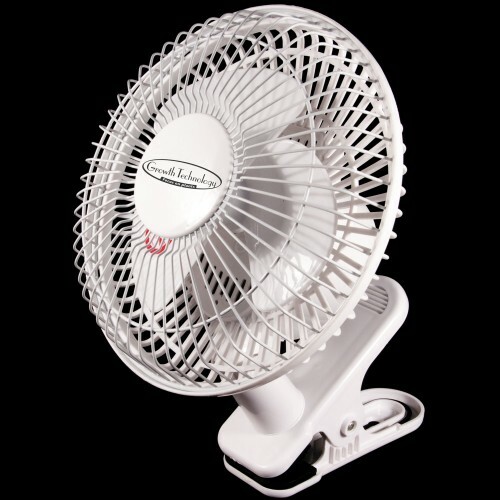 Keeping the air moving around in a small area such as a tent, is easy with this small 6 Inch Clip-on Fan. The fan can be quickly attached to tent frame or a shelf and doesn’t take up the space of a pedestal fan. Great little product. RAM Air Circulation Floor Fans are for creating a breeze in your grow room to help circulate air, st.. When using circulation fans always make sure they are not too close to your plants, the effect youre..
Secret Jardin Oscillating Tent FanThe Secret Jardin Oscillating Monkey tent fan is a very convenient..
Cuttings And Seeds Propagation Tent Kit Begin up to 77 seeds or cuttings with our top of the l..
What is BioBizz All Mix?BioBizz All Mix is a heavily pre-fertilized soil mixture. It has been design..
BioBizz Bio BloomWhat is Bio BloomHoping for exuberant flowers that lead to tasty fruits? Then this ..
What is Bio·Grow?You can apply this liquid growth fertilizer to most types of soil and substrate mix..
BioBizz Top Max There are three excellent reasons to use BioBizz Top Max 100% organic flowering stre..
Vitalink Essentials PH Down Vitalink Essentials PH Down is a concentrated phosphoric acid that ..